A thief steals a vehicle owned by a business and causes an accident that injures another driver or a pedestrian. Can the injured party sue the business for bodily injury? The answer is generally no. A vehicle owner isn't normally responsible for an accident that occurs while the auto is being driven without his or her permission. Thieves rarely ask for permission before they drive off in a stolen auto. Thus, in most cases, the vehicle owner isn't liable for injuries sustained by third parties in an accident caused by a thief. The rules that protect vehicle owners from liability for the acts of car thieves have some exceptions. If accident victims are unable to obtain compensation for their injuries from auto thieves, they may rely on these exceptions to sue the vehicle owners for damages. In most states, a vehicle owner isn't liable under common law if a thief steals his auto and negligently causes an accident that injures a third party. 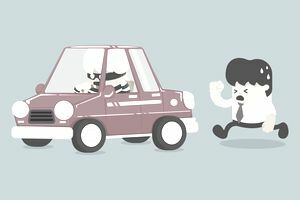 The thief rather than the owner is liable to the third party for any injuries he or she has sustained in the accident. In some cases, the vehicle owner and the injured party may disagree as to whether the vehicle was used with the owner's permission. If the claimant can prove that the owner gave permission, will the owner be liable for the accident? The answer depends on the law in the state where the accident occurred. Approximately 10 states have enacted permissive use laws. These laws make vehicle owners responsible for accidents caused by others who are driving the autos with the owners' permission. Every owner of a vehicle used or operated in this state shall be liable and responsible for death or injuries to person or property resulting from negligence in the use or operation of such vehicle, in the business of such owner or otherwise, by any person using or operating the same with the permission, express or implied, of such owner. When a vehicle owner gives permission to drive an auto, the consent may be express (verbal or written) or implied. Implied consent means permission granted through actions or non-actions. For example, suppose that Bill grabs Jim's car keys off Jim's desk. Bill says he's headed to lunch at a restaurant several miles away and walks out the door. Jim sees Bill take the keys but doesn't protest. Because Jim hasn't objected or tried to stop Bill from driving the car, Jim has given Bill implied consent to use it. In some states, a vehicle owner can be held responsible for auto accidents caused by family members under "family purpose" laws. These laws exist in about 18 states. They impose liability on vehicle owners for auto accidents caused by a spouse, children, or other family members. Some of these laws impose liability on the vehicle owner whether or not the auto was used with the owner's permission. Thus, in some states, a vehicle owner could be held liable if a family member stole the auto and caused an accident that injured another party. An employer is vicariously liable for an auto accident caused by the negligent driving of an employee. This rule normally applies when the employee is using a vehicle in the employer's business. Does it apply if a worker is driving a vehicle for a non-business purpose? For example, Sam operates a bakery business that owns several trucks. Sam has verbally informed his workers that only delivery personnel is permitted to drive the vehicles. One day, a kitchen employee takes a truck without Sam's permission to run a personal errand. The worker causes an accident that injures another driver. Is Sam's business liable for the injury? The answer is maybe. Sam might have given permission to use the truck through his actions rather than his words. Also, the bakery might be liable for the accident under a state permissive use law. In some states, an auto owner who leaves a vehicle unattended with keys inside may be held liable under common law for an accident caused by a thief if the owner should have known that theft was likely. For example, Tim operates a towing business. Tim receives a request for a tow from the principal of a local high school. Tim drives his truck to the school. He parks the truck in the student parking lot with the keys in the ignition and enters the school building. Once Tim is out of sight, a teenager hops into the truck and takes it for a joyride. The teen causes an accident that injures another driver. In some states, the injured party could sue Tim's business for damages. The claimant could argue that Tim was negligent when he left a dangerous vehicle with the keys inside in a location where teens were likely to find it. Colorado residents can comply with this law by using a remote starter system and adequate security measures. "Puffer" laws vary from state to state. Some prohibit owners from leaving running vehicles unattended for any length of time regardless of the temperature. Some apply only to large trucks or school buses. Others specify a time and/or temperature limit. For instance, a law may permit vehicles to idle for up to 15 minutes if the air temperature is below freezing. Violators of "puffer" laws may be subject to a fine. In some states, vehicle owners who violate the anti-theft law could be held liable for injury or damage to third parties caused by a thief. The auto liability section of the standard business auto policy includes permissive use coverage. It covers (as an insured) anyone driving a covered auto you own, hire or borrow with your permission. If a thief steals a vehicle owned by your business and causes an accident in which someone else is injured, your auto insurer isn't likely to cover a claim by the injured party. Do You Employ Distracted Drivers?